PMC ammunition manufacturers each component that goes into their ammunition from raw materials and pride themselves on having full control over the quality of each round they produce. Made in South Korea by the Poongsan Corporation, PMC has become one of the most popular range ammunition in the world, known for their consistency and reliability. The PMC eRange .40 S&W is loaded with a 165-grain EMJ-NT projectile and is loaded into boxer-primed, noncorrosive reloadable brass cases and is capable of a muzzle velocity of 989 fps. The enclosed metal jacket is non-toxic and reduces airborne materials and residues from fired rounds making these an environmentally friendly line of ammunition. This also means less toxic materials being put into the air, making this target ammunition perfect for indoor ranges where ventilation may be an issue. 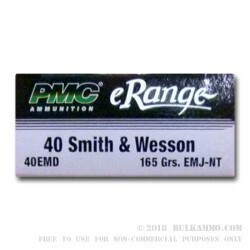 Each box of eRange .40 S&W contains 50 rounds.